We ask that members do not use the grounds during our Private Functions. Please see the calendar on our Home Page or below for the current month’s dates. Since March, 1959 we have been close with the OFAH. In September, 1962 we spoke our concerns and submitted a proposal for the preservation and existence of the hare to the OFAH and a law of limits on the number of hare in possession came into being. GCHFC was the setting for many OFAH meetings that hosted many of Ontario’s people that thought on the same lines as us in preserving & protecting wildlife. Some members did not agree that being a member of OFAH fit in their vision, but after meeting with the Zone J director in 2013 more members saw that OFAH is not only about Hunting and Fishing. 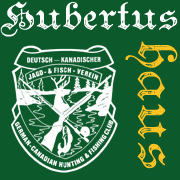 It is about conservation and all members of Huertushaus are members of OFAH. Since 1985 we have been an accredited Festhalle. Being part of KWO ensures our Name “Hubertushaus” is spread across the country. In 2002, one of our Past “Miss” noticed garbage along the road to the club. She then researched the Region of Waterloo and found a compatible partner with the Adopt a Road. Every Work day and Oktoberfest set up day Miss Hubertushaus, along with many friends, take a walk along Bleams road and pick up all kinds of things left behind or blown around.